We will walk through the steps below to understand the process. 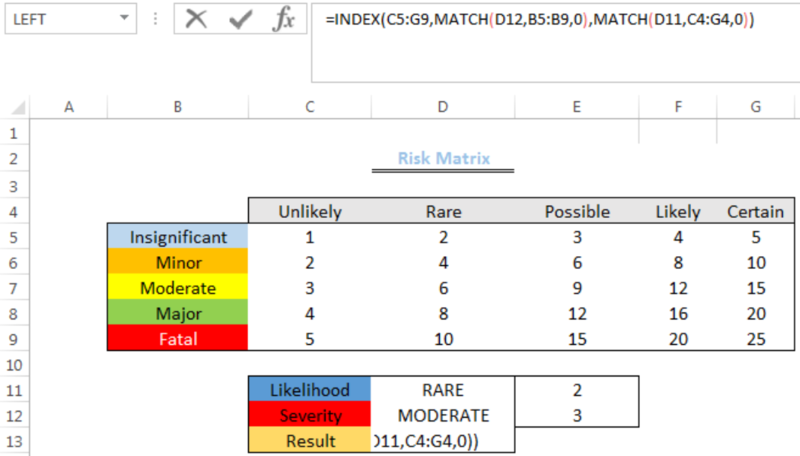 D11 is the lookup value, C4:G4 is the range and zero indicates an exact match. The same scenario applies to determine the severity. This method is preferred to the ALTERNATIVE METHOD because we can vary the SEVERITY and LIKELIHOOD in Cells D11 and D12 respectively to AUTOMATICALLY get the result. Extract data from a drop down list and move it to another sheet. For example, if they answer yes on a question or maybe i would like to put all the yes on one tab and another tab with all the maybe answers. So for the tab Risk Identification Aid tab on column F if they answer yes or maybe i would like that to automatic populate columns A(Risk Identifier) and B(Risk of misstatement description) to the yes tab and maybe tab. Create a macro to shift values in the matrix one character position to the right, from the end of one row to the start of the next row, and from the end of the matrix to the start of the matrix.